Q. Who has authority to Decommission and to Breach the LSR dams? A. The U.S. Army Corps of Engineers has that authority because LSR Dam breaching was an Alternative of their currently operating EIS. 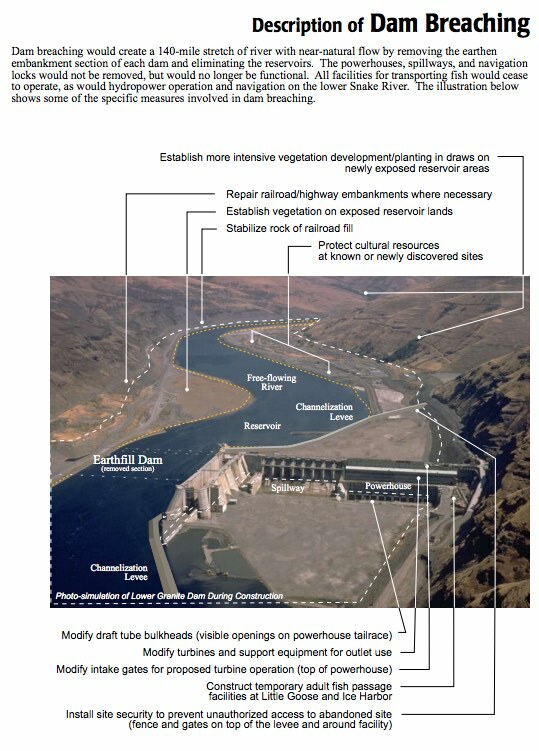 Markedly, Alternative 4—Dam Breaching was an "environmentally preferred alternative" in their 2002 FR/EIS. During the CRSO meeting on October 27, 2016 at Kootenai River Inn, I recorded Steve Barton telling me of the usual course of actions if an alternative in an operating EIS is found to be failing. Back to your question, you have a proposed alternative and then it plays out over time and either it is successful or not or anyone wants to revisit some of the other things that were studied, it will depend on the complexity of the next best alternative or selection of any of the other alternatives that wasn't incorporated. And depending on what that is, would depend on the level of effort it would take to actually switch to incorporate an alternative or aspects of alternatives that weren't in the proposed. Because if it is something, well we already analyzed it, maybe it’s just dusting off the numbers. Or maybe, its you know, the world has changed so much that that one would have to be completely reanalyzed. -- Steve Barton, Chief of Water Management Division for Northwest USACE. Most negative impact to low-income and minority populations (due to buying out irrigated farmland deemed to costly to mitigate). laws that generally apply to all Corps projects. Using these and other authorities, the Corps operates multiple-use water resource development projects to balance operation of individual functions with operations for all functions. This operation is coordinated with BPA, BOR, and other regional interests. The authorized uses of the Lower Snake River Project are power generation and inland navigation, fish and wildlife, irrigation, and recreation. (These facilities operate as run-of-river dams and are not authorized for flood control). These uses have been authorized under several public laws (Table 1-3). This Feasibility Study was conducted with consideration of authorization legislation and other laws including ESA; the Pacific Northwest Electric Power Planning and Conservation Act; the Fish and Wildlife Coordination Act; Section 216 of the 1970 Flood Control Act; River and Harbor Act of 1945; Sections 103, 105, and 905 of the 1986 Water Resources Development Act; Water Supply Act; Federal Water Pollution Control Act; and the water resources appropriations bills passed by Congress in 1996, 1997, and 1998. In particular, the ESA requires all Federal agencies to ensure that actions taken by the agency are not likely to jeopardize the continued existence of a species that has been listed as threatened or endangered or result in the destruction or adverse modification of critical habitat. In addition, the ESA provides agencies with the responsibility to carry out programs for the conservation of listed species. ESA DEFINITIONS: "conservation" means to use and the use of all methods and procedures which are necessary to bring any endangered species or threatened species to the point at which the measures provided pursuant to this Act are no longer necessary (aka. de-listing). ". . . Snake River, Oregon, Washington, and Idaho: The construction of such dams as are necessary, and open channel improvement for purposes of providing slack-water navigation and irrigation in accordance with the plan submitted in House Document 704, 75th Congress, with such modifications as do not change the requirement to provide slack-water navigation as the Secretary of War may find advisable after consultation with the Secretary of the Interior and such other agencies as may be concerned: Provided, that surplus electric energy generated at the dams authorized in this item shall be delivered to the Secretary of the Interior for disposition in accordance with existing laws relating to the disposition of power at Bonneville Dam; provided further, that nothing in this paragraph shall be construed as conferring the power of condemnation of transmission lines; . . ."
"For the purpose of recognizing the vital contribution of our wildlife resources to the Nation, the increasing public interest and significance thereof due to expansion of our national economy and other factors, and to provide that wildlife conservation shall receive equal consideration and be coordinated with other features of water-resource development programs through the effectual and harmonious planning, development, maintenance, and coordination of wildlife conservation and rehabilitation . . ."
The water areas of all such reservoirs shall be open to public use generally, without charge, for boating, swimming, bathing, fishing, and other recreational purposes, and ready access to and exit from such water areas along the shores of such reservoirs shall be maintained for general public use, when such use is determined by the Secretary of War not to be contrary to the public interest, all under such rules and regulations as the Secretary of War may deem necessary. No use of any area to which this section applies shall be permitted which is inconsistent with the laws for the protection of fish and game of the State in which such area is situated. Breaching is reversible, extinction and ecosystem collapse is not. The concept of sustainability has been increasingly brought into focus as we have become convinced that all systems on earth are interrelated and that many of today’s problems were the solutions of yesterday. Sustainability is, however, a very old concept. Most American Indian cultures understood the importance of sustainability and sustainable development, living in harmony with all things. Many people are familiar with the Seventh Generation philosophy commonly credited to the Iroquois Confederacy but practiced by many Native nations. The Seventh Generation philosophy mandated that tribal decision makers consider the effects of their actions and decisions for descendents seven generations into the future. There was a clear understanding that everything we do has consequences for something and someone else, reminding us that we are all ultimately connected to creation.